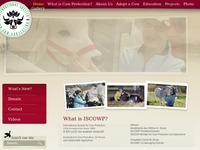 The official website of International Society for Cow Protection, which is a non-profit organization in USA. Conducting cow protection classes, Training Teamsters and Oxen, implementing the Adopt A Cow Program, etc. are its various activities.